Bernie Sanders sharpened the contrast with Hillary Clinton on a bevy of liberal causes on Saturday, casting himself as a principled progressive before thousands of Iowa Democrats in an appearance that could set the tone for the leadoff presidential caucuses in February. Sanders, the independent Vermont senator, never mentioned Clinton by name at the high-profile Iowa Democratic fundraising dinner – known as the ­Jefferson-Jackson Dinner, or JJ – but implicitly criticized her delayed opposition to the Trans-Pacific Partnership and Keystone XL pipeline as well as her vote in favor of the Iraq war and passage of the Defense of Marriage Act during her husband's administration. "I promise you tonight as your president I will govern based on principle not poll numbers," Sanders said, eliciting roars from his supporters. 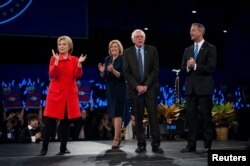 From left, Hillary Clinton, Iowa Democratic Chairwoman Andy McGuire, Bernie Sanders and Martin O'Malley greet the crowd at the Jefferson-Jackson Dinner in Des Moines, Iowa, Oct. 24, 2015. Clinton did not respond in kind, making the case that she would be best equipped to take on the Republicans. "I hear Donald Trump when he says we have to make America great again," Clinton said. "America is great -- we just have to make it fair and just." Clinton made a direct appeal to Biden's supporters, saying that the vice president has been at Obama's side every step of the way. "He has fought passionately for middle-class families and middle-class values," she said. Former Maryland Gov. Martin O'Malley, who trails both by a wide margin, reached for a breakout performance at the dinner, presenting himself as a fresh face in the party, who got things done in his home state. "We cannot move beyond today's gridlocked politics by returning to the divisions of our past," O'Malley said. "I'm not about that." The speech marked a more aggressive turn by Sanders, who struggled at times to scrutinize Clinton's record during their first debate in Las Vegas earlier this month. In that encounter, Clinton offered a full-throated rebuke of Sanders' record on gun control, noting his opposition to the 1993 Brady Bill and his backing of a 2005 law that shields gun manufacturers, distributors and dealers from most liability lawsuits. This time, Clinton only made a passing reference to Sanders on gun control, saying, "I won't be silent" on the issue. Reid Sheldahl of Des Moines, Iowa, cheers as Democratic presidential candidate Sen. Bernie Sanders, I-Vt., speaks during the Iowa Democratic Party's Jefferson-Jackson fundraising dinner, in Des Moines, Iowa, Oct. 24, 2015. Sanders, meanwhile, pointedly assailed the passage of the Defense of Marriage Act during Bill Clinton's administration, saying, "some are trying to rewrite history by saying they voted for one anti-gay law to stop something worse. That's not the case." Hillary Clinton said in an interview with MSNBC on Friday that the law was signed as a "defensive action." Sanders vowed "not to abandon any segment of American society whether you're gay or black or Latino or poor or working class -- just because it is politically expedient at a given time." Eight years ago, Obama suggested Clinton was motivated by polls and triangulation while the then-New York senator countered that "change is just a word" unless you have the strength and experience to lead. This time, Clinton presented herself as Obama's heir, warning Republicans would seek to slash taxes for the wealthy and repeal President Barack Obama's health care law. "I'm running as a proud Democrat," the former secretary of state said to a large cheering section that waved blue neon sticks. "We need to defend the progress we've made under President Obama and build on it until the recovery is secure." But Republicans insisted Saturday that today's Hillary Clinton is the same one who ran eight years ago. "The Hillary Clinton of 2015 is no different than the Hillary Clinton from 2007, who at the time refused to be straightforward with Iowans," said Republican National Committee spokesman Fred Brown. "Things haven't changed." Singer Katy Perry, center, applauds as the Democratic candidates for president take the stage at the Jefferson-Jackson Dinner in Des Moines, Iowa, Oct. 24, 2015. One hundred days remain before Iowans nominate their presidential candidates, and the state Democratic party's annual Jefferson-Jackson dinner drew a raucous crowd of more than 6,600 activists in what traditionally serves as a kickoff to the Iowa caucuses. It capped a daylong pageant of political activities: Former President Bill Clinton headlined his first rally of the campaign, introducing pop singer Katy Perry at a free concert for Clinton's faithful. Sanders led cheering supporters across a Des Moines bridge in a march that included chants of "Hey, hey, ho, ho, the oligarchy has to go!" Clinton's campaign has been on an upswing this month. She received a boost from Biden's decision not to run, then put together a grinding, competent appearance before a Republican-led congressional committee probing the deadly 2012 attacks on diplomatic outposts in Benghazi, Libya. Two lesser-known rivals, Jim Webb and Lincoln Chafee, abandoned the race following Clinton's strong performance on Oct. 13 in the first primary debate. The dinner was an important showcase for Sanders, a Vermont independent who has drawn large crowds with his calls for a "political revolution" but trails Clinton in national polls. Playing the role of underdog, Sanders drew a comparison with Obama. "I think we are going to prove the pundits wrong again. I think we are going to make history one more time."